On her good days, you can find Occupational Therapy student Jasmine Price in a bachata or salsa dance class, headed to the gym or laughing at nothing with her best friends. On her bad days, she’s using all her might to keep her anxiety from causing her to pass out. 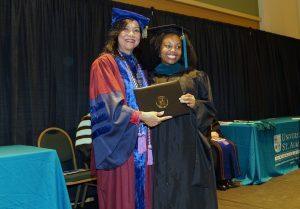 Price graduated from the University of St. Augustine for Health Sciences (USAHS) with a Master of Occupational Therapy (MOT) degree. 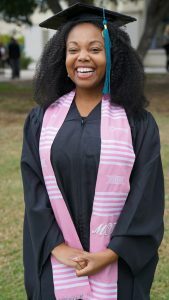 She is the first in her family to go to college and receive her undergraduate degree, and also the first to attend graduate school. She has overcome mountains of personal, mental and emotional obstacles to make it to the stage at Commencement. These obstacles may have set her back a term or two, but she didn’t let them keep her from the finish line. 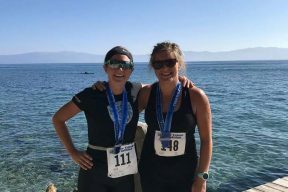 Price struggled with her mental health long before arriving on the USAHS San Marcos campus, but with a big move away from her support system in the Bay Area, a rigorous MOT program, a new curriculum and bouncing around from cohort to cohort she was forced to come to new terms with her mental illness. It began to affect her physically, causing her to isolate herself and sometimes pass out. 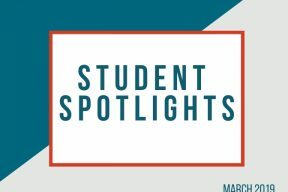 It was a personal struggle for Price that helped her begin to speak out about her needs and shaped USAHS’ OT program and its ability to accommodate students with mental illness and other disabilities. Price had to accept that she was different, and her learning experience was going to be different. She realized that for her to make it through the program she had to be her own advocate and work with the school to find solutions that accounted for her disability. Acknowledging this not only helped Price academically, but her role and outlook as an Occupational Therapist changed. She feels like she can connect with patients and families on a different level because she knows what it’s like to be different and face challenges that mentally and physically healthy people don’t face. While this realization and newfound acceptance was wonderful, it took her a while to get there. She fell back two terms, became a “rainbow” student going through two cohorts before ending up with the Red Cohort she will be graduating with today. The Red Cohort welcomed her with open arms and has helped her through her journey. She felt lost and alone prior to joining the Red Class, but all it took was one person to bring her back up. She said once she found this friend, a lot of things started going her way. She had someone who was going through the same stress she was in school and that validated her feelings. Price also completed a Spanish for Health Care Professional’s certificate at the University of California, San Diego and is on her way to receive the Spanish Language Certificate. She crosses the border to Tijuana on the weekends in order to work with children and families in lower socioeconomic settings. Price is diversifying the field of Occupational Therapy and her patients notice. She recalled a mother whose child was recently getting treatment, and she said to Price, “You have no idea how happy I am to see you here.” This mother had been working with Occupational Therapists for several years with her child who is on the Autism spectrum, and Price was the first OT she encountered who “looked like her.” This powerful moment for Price further solidified her decision to go into acute pediatric care. More specifically, she wants to work with children in orphanages in foreign countries. Price still has her bad days, but she is motivated by her differences. She looks back and sees how much she has overcome and wants to take that experience into the field with her to help others overcome and accept those differences. After graduation, she’s headed to Costa Rica for three months to study in the Immersion program. She then wants to stay in San Diego and work with minority populations in the area and work across the Mexican border when she can. The most valuable lesson Price has learned in the USAHS MOT program is when she takes care of herself she is able to be the best therapist she can be.